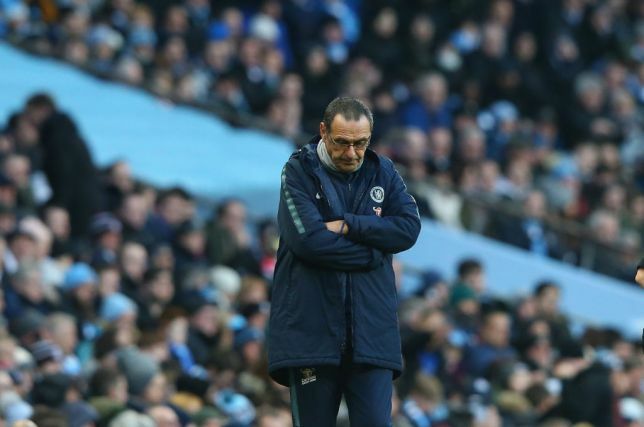 Chelsea boss Maurizio Sarri is under immense pressure after his side lost 6-0 to Premier League champions Manchester City on Sunday, and many fans on social media have asked the club to announce his sacking, but Sky pundit Gary Neville thinks otherwise. The Blues have been inconsistent this season, playing the kind of football Sarri introduced at times, but not getting consistent results to go with it. After beginning the season smartly with his side going unbeaten in all competitions for 18 games before their 3-1 loss to Tottenham Hotspur in November 2018, Sarri’s style has come unstuck for months now. The signs were positive that Chelsea could finally be playing attractive football and churn out good results at the same time. Now the writing on the wall is that the former Napoli boss could be sacked after leading Chelsea to a historic defeat in the Premier League. Sky Sports pundit, Neville says the Stamford Bridge club’s top hierarchy should be patient with their head coach as legacies are built over time.